Chaz Davies has unveiled the new bike he hopes will power him to the World Superbikes title. 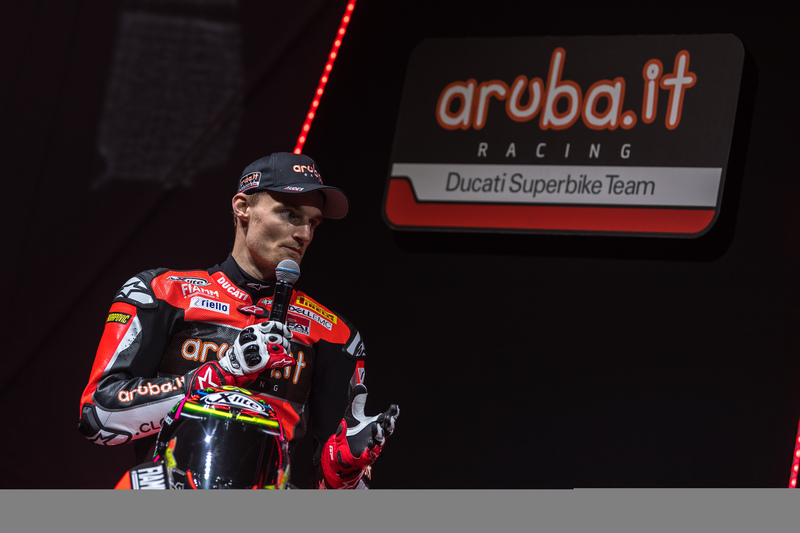 The Knightorn-born rider insists he is more motivated than ever for the season to start after taking the wraps off the new Aruba.it Racing-Ducati Panigale V4R in Italy. Davies’ team will race a four-cylinder Superbike for the first time when the season starts in Australia last this month. “I’m very excited and motivated about the season that’s about to start,” said Davies at the presentation at Aruba’s Global Cloud Data Center at Ponte San Pietro near Bergamo. Davies – who will have a new team-mate in Alvaro Bautista this season – has been hampered in the last two tests by a twinge in his back. The 31-year-old also had surgery during the winter on the shoulder he bust twice last season when he finished runner-up to Jonathan Rea for the third time in four seasons. But Davies is confident he will be stronger than last season as he prepares for the final test in Australia on February 18th and 19th before the opening round at Phillip Island which starts with opening practice on February 22nd. “My last tests were hampered a bit by the twinge I felt in my back, but my overall physical condition is much better than last year and in any case we managed to complete our test schedule,” added Davies. “We’ve still got two more days of testing left and they will be fundamental to define the last details, and then finally we’ll be racing again. Chaz Davies with his new Superbike. Stefano Cecconi, CEO of Aruba S.p.A. and Team Principal: “The previous seasons have given us a lot of satisfaction, but we still have to achieve that much-coveted title, and the Panigale V4 R undoubtedly represents an extra resource in our arsenal. “The bike’s potential is really high, and there are no limits to our ambitions. Ever since we started to collaborate with Ducati, we have always been protagonists in the Superbike World Championship, and we count on being so this year as well with Chaz and Álvaro.